Kim Kardashian and Kanye West spent Father’s Day with Caitlyn Jenner – in an effort to absorb some of her limelight, no doubt! In May, Kim Kardashian announced she was pregnant with baby number two – and nobody cared. On Father’s Day, Kim announced that she is carrying Kanye West’s son – and nobody cared. Why? Because everyone is still buzzing about Caitlyn Jenner’s transition and Vanity Fair debut. For the first time in her life, Kim Kardashian has had to take a backseat to one of her family members and is not the center of attention – and the reality TV diva is not handling it well. If you can’t beat them, join them! The Keeping up with the Kardashians star has finally accepted defeat and has come to terms with the fact that her pregnancy is irrelevant in comparison to Caitlyn Jenner’s transgender transformation. So she is doing what any fame-hungry reality TV star would do. Since she can’t be the center of attention, she is making sure that she is always within a camera shot of the actual center of attention – Caitlyn. On Father’s Day, pregnant Kim Kardashian and Kanye West spent the afternoon with Caitlyn Jenner, and a slew of Kim’s siblings – of course she made sure to capture as many photos as she could by Caitlyn’s side so that she could spam social media with them. 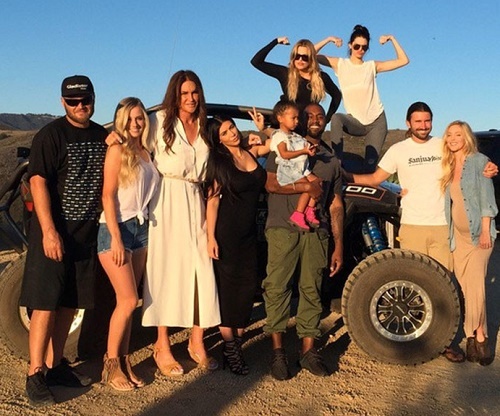 Kim and Kanye joined Caitlyn, Khloe, Kendall, and her step-brothers, Brandon and Burt, along with their significant others for a day of dune buggying in Malibu. You know Kim Kardashian is desperate for attention if she endured slumming it with her non-famous step-brothers just so that she could get a few pictures with the famous Caitlyn Jenner. Kanye of course went along for the ride; there’s no such thing as bad publicity, right? At this point, the only way anyone would care about Kim Kardashian’s pregnancy is if Caitlyn Jenner posed for a picture holding up one of her ultrasounds. Seriously, how hilarious is it that Kim Kardashian is losing the limelight to her transgender step-father? Do you think she actually wanted to spend Father’s Day with Caitlyn, or was she just trying to remain relevant? Let us know what you think in the comments below!